Passover means matzo, and it’s no secret that enjoying matzo for seven or eight days means finding a few ways to get creative. So, we rounded up some deliciously sweet desserts that don’t just swap in matzo, but take advantage of its toasty flavor and crunchy texture. We’d make these all year long. Dripping with chocolate and plenty of nuts, Andrew Zimmern’s toffee matzo is so good you’ll want it long after the holidays are over. 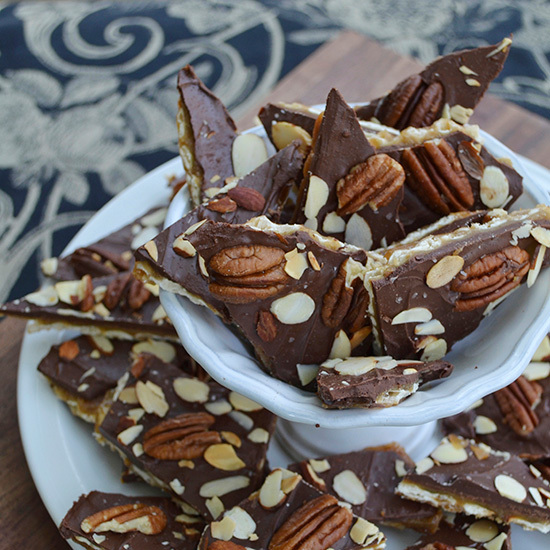 Crispy, crunchy matzo provides the perfect base for rich and sweet brown sugar toffee, and using chocolate chips to melt on top makes this a quick and easy treat to whip up. An icebox cake has to be one of our favorite no-bake desserts. They’re as delicious as they are easy to make, and those layers are pretty beautiful, too. Here, we swapped the traditional cookies for matzos soaked in a little milk. The soak helps the matzo really bond with each layer of ice cream, and keeps it from staying too crunchy. It’s a very flexible recipe, so have fun with it. Below are our guidelines. Line a 9-by-4 inch loaf pan with foil, allowing 2 inches of overhang. Spread 1 cup of softened ice cream in the bottom of the pan. Soak a piece of matzo in milk for 30 seconds and then arrange on the ice cream, breaking the matzo to fit snugly. Repeat the layering with more ice cream and milk-soaked matzo until you reach the top of the pan, ending with a layer of ice cream. Cover with plastic and freeze for at least 4 hours or overnight. Remove the plastic and, using the foil, lift the cake out of the pan. Invert it onto a work surface and peel off the foil, then cut into slices and serve. This silky cheesecake gets sweetness and tang from a blend of cream cheese and sour cream. Matzo meal and ground almonds replace the usual graham crackers in the crust for a nutty, toasty crunch. Topped with sugary strawberries and toasted almond slivers, this cake makes a beautiful centerpiece at any table. Sweet-tart berries, tossed with just enough sugar and lemon juice, get topped with salty-sweet crumbled matzos for the perfect springtime dessert. Serve with your favorite vanilla ice cream or dollops of barely sweetened whipped cream. Rich, dark chocolate, butter, just the right amount of salt, and finely ground matzos make these crumbles the perfect sundae topper. Here, we sprinkled them over vanilla ice cream with a generous drizzle of creamy caramel sauce.